*Submitted setlist below on 20140709. 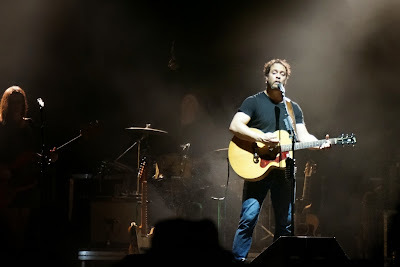 I definitely enjoy Amos Lee's work, but unfortunately haven't listened to him in a while. Having saw him perform on both a small and large stage at Bonnaroo, I ultimately made the difficult choice not to see the beginning of his set this year at Firefly (I instead opted to watch San Fermin, a new favorite). With that being said, I was able to arrive ten minutes past ten and enjoy about half of what remained of his set. Side note: I now (20140709) own three band shirts: Amos Lee, Matt & Kim, and San Fermin. : He starts off with a call and response on "yeahhhh."